On-loan striker Luke Williams says he was a bit shocked to be handed an immediate start at Coventry City, but is determined to get his career going. Williams, 21, joined the Sky Blues for the rest of the season on transfer deadline day from Middlesbrough and played his first game since 20 December at Preston last Saturday. "It was a nice surprise," Williams told BBC Coventry and Warwickshire. "It was a shock because there are a lot of good players here." Williams has five times for Boro this season, scoring in the Championship club's League Cup win at Oldham in August. 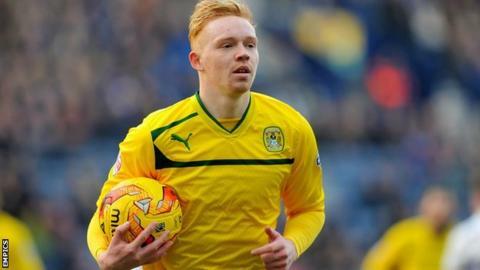 He joined Coventry's League One rivals Scunthorpe in October on a two-month loan, netting twice in six games. His last previous action was at Bradford five days before Christmas, but he says his hard work since he arrived at the Ricoh Arena meant he was prepared to get straight back into playing. "It was my first game in six weeks, so I'm pleased," Williams said. "I trained all week, so I got to know our shape and system but all the lads have made it easy for me. "I'll try and bring a bit of a spark going forward and get some goals. "It's a lot more frantic in League One but that's what helps you develop as a player." Williams is already looking forward to an immediate reunion with Scunthorpe on Tuesday, when former Sky Blues players Jordan Clarke and Gary McSheffrey return to the Ricoh Arena with the Iron's ex-Coventry boss Mark Robins. "I'm so looking forward to playing against them."